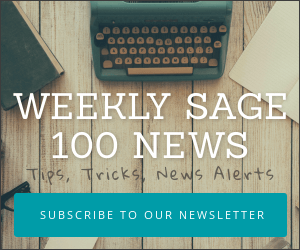 Sage just announced the discontinuation of the hosted version of their Sage CRM. The product will still be sold to companies who want to load it onto their own servers or use the services of a private host. Previously, during October 2016 Sage had announced no new licenses to this hosted service would be sold. This announcement, therefore, appears to primarily apply to any remaining existing users of the Sage CRM Cloud/Hosted version. Sage CRM continues to have an available integration to Sage 100 and Sage 100cloud. This announcement only impacts the Sage CRM.com product which Sage sold and hosted themselves for customers. The regular Sage CRM on-premises product is NOT retiring. We’ve recently undertaken a full review of our CRM portfolio. As a result of this review, we have made the difficult decision to retire the current Sage CRM.com hosted / cloud product as of August 31, 2019. After this date, you will no longer be able to access Sage CRM.com. This decision will enable us to focus our time and resources more efficiently to ensure we continue to deliver market-leading solutions for our customers. Effective immediately, no further sales or upgrades can be purchased. Technical support will continue to be available until August 31, 2019. Customers will be directed to contact their support provider for transition options. For your customers that are currently using this solution, we’d ask that you work closely with them to ensure that they do not permanently lose access to their data. Before August 31, 2019, data must be backed up to a separate location. Details on how to do this are available here. Migration of data from Sage CRM.com to Sage CRM is possible, although as the data is in a different structure, some effort is required to match the necessary import structure. Sage is unable to provide a migration tool, instructions or support if this is the option the customer selects. If you have any questions, please contact your Partner Account Manager.